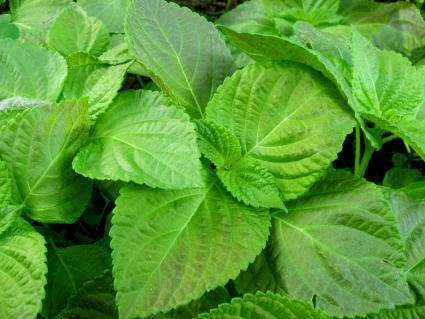 Shiso is part of the mint family and is called “beefsteak plant” or perilla in English. I don’t know where the name beafsteak comes from, but I think shiso sounds much better. There are two varieties, red shiso and green shiso. Green shiso is often used as a garnish, but it is also used in sushi, onigiri and other dishes. Shiso has a distinct and pungent, but very refreshing flavor. Perhaps the best thing about shiso – it’s really easy to grow. As with most greens, the early spring shiso is the best.